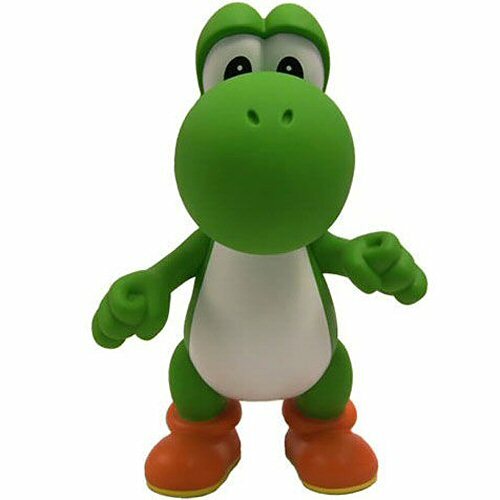 Buy Super Mario Bros Super Size Yoshi Figure [9"] in India at the best price. Screenshots, videos, reviews available. Straight from the Mushroom Kingdom to isles it's Yoshi! Although most Yoshis are endangered, luckily these figures are not. Built for play, Yoshi is a welcome and super cute addition to any worthy Mario Brothers action figure collection. Whether you're just getting to know Mario and friends on the Wii - or have been acquainted since the original NES - these are figures you won't want to miss! Based on the classic designs of Mario, Yoshi, Luigi and a host of other characters, now you can add them to your collection... no gaming console required! Each figure stands approximately 9-inches tall and has movable arms and legs.